First of all, before you read this post I must apologise to Pizza Pilgrims and Banh Mi 11 here. 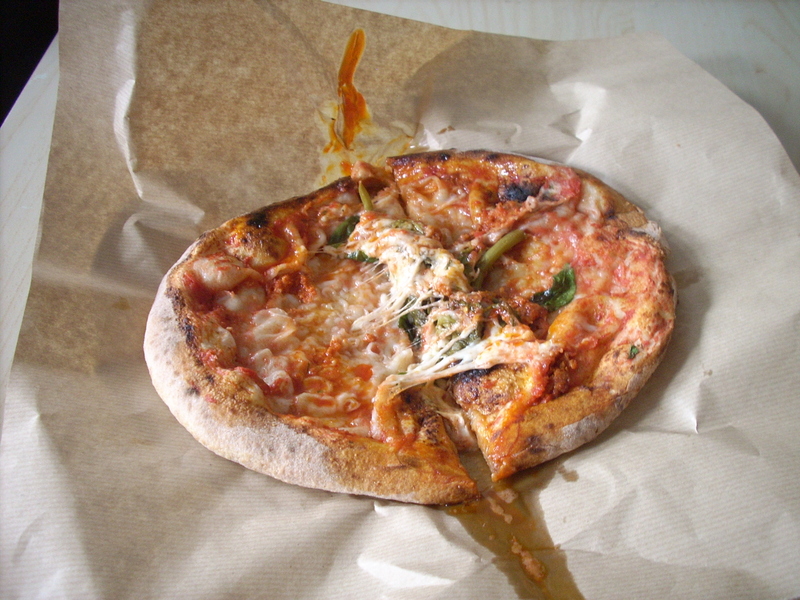 I started this blog the day Pizza Pilgrims started at Berwick Street and it has taken me this long to finish it. As a consequence, although I may have, in theory, been one of the first people to visit and write about them, I am, in fact one of the last (sorry Cheese & Biscuits). Poor show and blooming lazy on my part. The End. Berwick Street has always been known for its fruit and vegetable market, but recently I have noticed other food stalls are creeping in. With food stalls and collectives spouting all over the places (see EatSt at King’s Cross and Netil Street in Hackney and as well as the Long Table – and I’m sure there are many I don’t know about), it was only a matter of time before they crept in here. In fact Banhmi11 had relocated from Kings Cross to Soho. Sorry EatSt. Brilliant news for us office workers though. Lunchtimes are looking up. The newest chaps on the block though are Pizza Pilgrims – who cook pizzas to order from the back of an authentic pizza oven installed in the back of a Ape van (it’s Italian for bee, which gives you an idea of how compact it is). The selection on offer is small, but specials vary daily (think wild garlic, red onion, etc) – Margherita, Njuda (an Italian spicy salami – which packs a punch) with broccoli and a Marinara (tomato and oregano, without cheese). The principal is that they do a few things well and I’m all for that. [Since I have been I believe they are selling fresh bread and cake – even more yum…] I went for the N’juda – which I know I pronounced wrongly…..the crust was lovely and light with the right amount of crisp, puffy saltiness and as I mentioned before the spicy, soft salami gave a nice tangy kick. Apologises for the picture, I had to transport it back to the office. The boys did say that it was ‘hotter than the sun’ and they weren’t wrong, even after my sprint through the streets to be able guzzle it down, it was still piping. A final word, if you’re a girl and you think you can’t manage a whole one – go with a friend. But I’m sure you will. I did! And all for £6. You know what? With pizzas like these it’s hard not to ‘play nice’! Oh and they’re at The White Horse Hoxton tonight I believe! Chez Bruce is my local restaurant. It is also my favourite restaurant and was my mother’s favourite restaurant, so when I was given his eponymous cook book for my birthday I was overjoyed. I couldn’t wait to use it. But I needed a suitable occasion and recipients who would appreciate it – or at least put up with my wittering on about how amazing it would, hopefully, be. Last week the perfect opportunity arose – dinner for some dear friends, no slouches in the kitchen themselves. 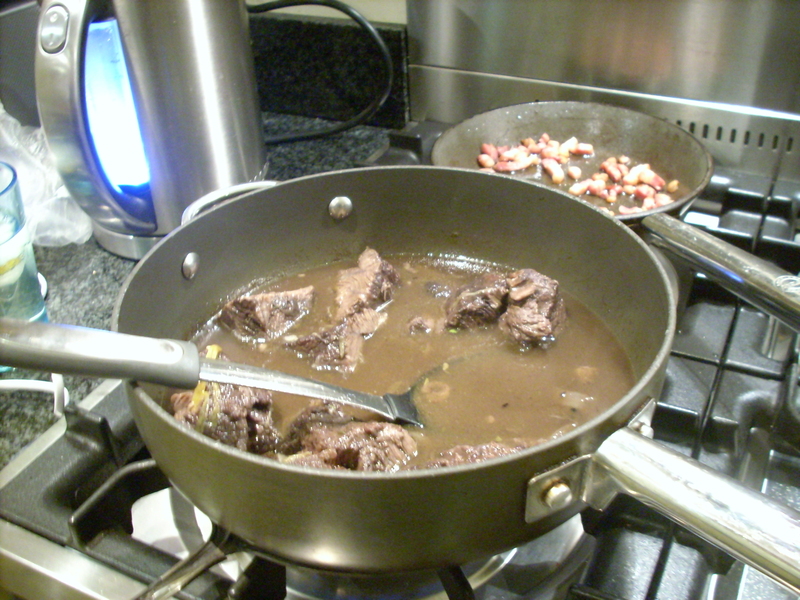 The whole book is full of recipes you want to try, but the boeuf bourguignon looked the most ‘do-able’ recipe – a classic that I had cooked before, albeit not using this recipe. It looked relatively simple, merely, as the name suggests, time consuming. A three-day concoction sounded rather impressive – rather ‘cheffy’ if you will – and the list of ingredients neither looked too long, nor too expensive. Bingo. Perfect. Now all I had to do was find ox cheeks. Cheeks seem to have become a very fashionable cut of meat, one of the ‘forgotten cuts’ (see also cods’ and pigs’) – much like old-fashioned children’s names such as Ethel are now de rigeur – I’m looking at you Lily Allen – cheeks are turning up on menus again. I found pigs’ cheeks whilst drooling over the menu at Ben’s Canteen. Definitely worth a visit I think. Anyway back to those ox cheeks. One local butcher said they didn’t stock them and that I was in fact the first person to ask for ox cheeks in twenty years. 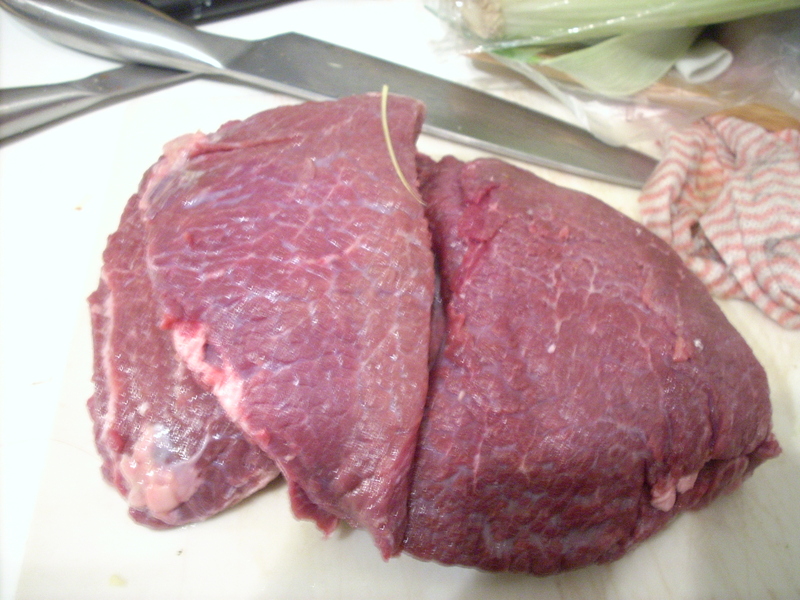 Chadwick’s in Balham, could order them – but they were the most expensive at over £12 per kg. Moen’s in Clapham were very reasonable, but I couldn’t get there in time. So far, so faffy. Of all the places, I found the cheapest meat in John Lewis’ Food Hall, just round the corner from work. So far, so convenient. All that was left to do was buy the ingredients for the marinade. But did I have a big enough container to put it all in? In my case? No. Or not, unless you count a washing up bowl. Bruce specified ‘roomy’. 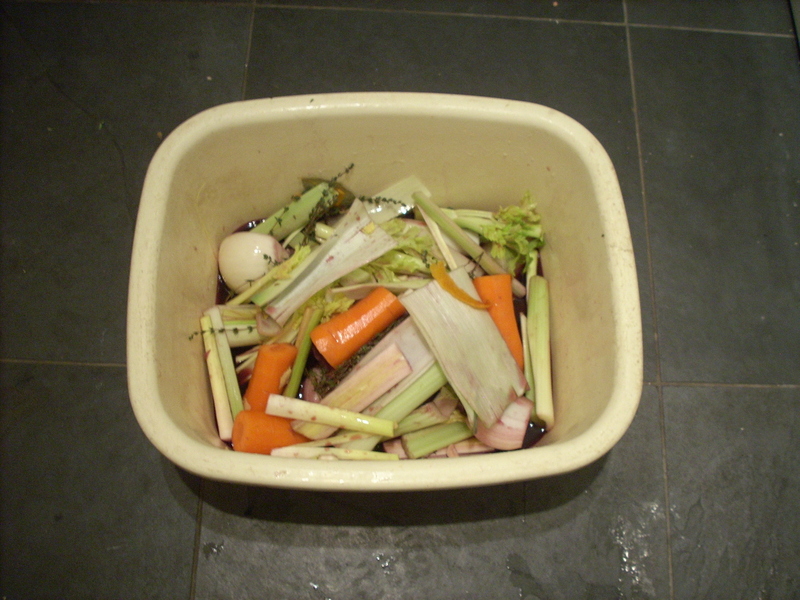 Who knew that some carrots, leeks and celery could take up so much space? This roomy enough for you Bruce? After a night resting in the fridge, I hot-footed it home from work – mainly because the casserole would take 3-4 hours. That’s after the reducing of the marinade and fannying around with the vegetables and ‘aromatics’ – that’s herbs to you and me. It was going to be a long night. As it was I managed to get it in the oven at just after 7.45pm. So at least it looked like I’d make it into bed by midnight. Phew. And more importantly – it smelled fantastic. Having cooled in the broth, I refrigerated the beef and reduced the sauce by half. ‘Reducing’ just seemed to me to mean ‘boil the bejaysus out of it’, but I have to say once I had ‘reduced’ it (see, I’m even speaking like a chef now) I could see why. I now had a rich, deep sauce. Delicious. To finish off this three day extravaganza the final ingredients (pancetta lardons, button mushrooms and button onions had to be cooked separately and added as the beef and sauce was slowly reheated on the hob. In the meantime I ‘whipped up’ a parsnip puree (the parsnips sauted in butter, cooked in milk then blended). I could easily have eaten a bowl of it on its own. Finally, the marathon session was nearly over. Unfortunately in my haste to get it to the table, I forgot to take a picture of the final plateful. I’m pleased to report that there weren’t any leftovers to take a picture of either. So I’m afraid you’ll just have to buy Bruce’s book and cook it yourselves. It’s worth it. I am compiling a list of future culinary challenges from it – see I haven’t been scared by the beautiful photography and neither should you! Happy New Year, Chin Up! On Sunday night if you’d listened really carefully you would have heard a collective sigh as everyone settled into their sofa for the new seasons of both Spooks and Downton Abbey (DA). Aside, from the furore about the scheduling (use iplayer or watch Spooks then ITV+1). When there’s a chill in the air and there’s finally something you want to watch on telly it’s a sure sign that autumn is finally here. Hurrah – time to cosy up. Satisfied though I may have been in my blissful little Sunday night bubble, others were clearly not so impressed, in History Today DA was criticised for a ‘cosy’ view of the period, saying it remained to be seen if the series had anything profound to say about the past (and I paraphrase here). I like cosy, what’s wrong with that. In The Independent it was the turn of Spooks. Apparently full of inaccuracies – I have no idea what the procedures would be in real life, but hello, have they seen a Bond film lately? The point I’m trying to make is that this is entertainment, not a documentary. It is escapist, enjoyable fodder, with love and drama thrown into a gripping story which keeps us rapt week after week, so what if Le Carre has the hump. Last night, in stark contrast (for me anyway), I inadvertently watched the beginning of the second series of the reality show, Made in Chelsea (MIC), the posher (though no more refined) cousin of The Only Way is Essex (TOWIE). The premis of the show is that it follows the lives (and seemingly loves) of a group of twentysomethings who live in Chelsea . The added twist of this series, as in TOWIE, is that the producers ‘suggest’ things that they would like to happen, so although this is ‘reality’, it isn’t. You could almost see them turning to the camera to be get their cue. Basically it’s making boring people’s lives even more boring. Then televising it. This is entertainment? Wow. I have never watched a more vacuous and insipid bunch of characters. It’s not the perception of privilege that is grating – if they can afford a Ferrari good on them, it’s just that I don’t give a toss about it , and I should. They all take themselves so seriously that any likeability is quickly stripped away. When Arabella confronted Ollie (it took how long before people realised he was bisexual? Really?) , when she couldn’t find her Tiffany bracelet and they had ‘words’ about his behaviour I felt it was completely devoid of emotion. Dead behind the eyes. When Francis Boulle looked out on the faces of dozen of his ‘fans’and stated that he was looking at future of entrepreneurs, I physically shuddered. One of the first rules of a good story is that you should care about the characters and what happens to them. Nils points all round. I’m afraid Jamie’s choice of Ferrari, left me unmoved and when Ollie did have the grace to look embarrassed, whether this was over the bracelet, his wooden ‘acting’. Or perhaps the extraordinarily odd ‘necklace’ that he had chosen to wear (if not producers shame on you – you meanies!). I polite way would be to describe it a ‘collar’. He looked like a female extra from Cleopatra. Give me Downton Abbey or Spooks any day over this so-called reality. Sorry – it’s been a while…. A year ago I left Falmouth after completely my MA in Professional Writing. Right now? I am watching Homes Under the Hammer (HUH). It’s my guilty pleasures whilst I’m looking for work. Again. To begin with my initial panic at a mortgage to pay – and no income – led me to think that the best (and by this I mean the safest and most cowardly option!) was to stick with what I knew – ie. PA work, fooling myself that I’d write in my spare time – a pipe dream and pure laziness, and, if I’m honest, utter fear. But sadly the work just isn’t out there. So now if I am to become a writer I must stop talking about it and actually write, because that’s what they do. Write? Right? I suppose this is a start, eh? That’s looking for a job, not watching HUH. I should be thankful I suppose that at least it’s not a repeat, I cannot tell you my outrage when the BBC tries to fob me off with reruns (see also, Midsomer Murders, ITV). Someone is just buying a building of 4 flats in Stoke Newington for £715,000 – bargain. And the presenters have started with the corny puns already – an electrician is ‘putting the spark’ back into the property. And can I just add I had NO idea there was so much advertised on TV which isn’t available in the shops! By just calling the number on the screen I could have both the Tranquility CD and The Contour Cloud Pillow. My finger is positively itching I can tell you. What else does today hold? Possibly a run (it’s sunny, although I envitably pick the one hour in the day when the weather become monsoon-like), some kind of food creation (soup? biscuits?). And looking for work. I see some tidying, gentle DIY – the bathroom is still not finished 7 months down the line, and some baking – (The Great British Bake Off is my new addiction – comfort TV at its best, see also Downtown Abbey – which starts on Sunday!). And looking for work.